Square has been a darling of the startup world since launching service in 2010. Now, as the mobile payment company looks ahead to 2013, it thinks it is poised to become a household name and a global brand, bolstered by support from ubiquitous partners such as Starbucks (s sbux) along with millions of other smaller merchants. Square had an amazing run in 2012, growing its merchant base from 1 million to 3 million while its annualized processing rate — the total value of transactions processed through Square — has shot up from $2 billion to now $10 billion. But if 2012 was transformational, Rabois believes 2013 has the potential to be huge. Rabois told me the Starbucks deal is a turning point that is allowing more consumers to run their lives through Square Wallet. The Starbucks deal, first announced in August, has prompted a deluge of interest from other retailers and businesses, who want to work with Square on payments, Rabois said. He said the company, which still hasn’t invested in a big salesforce, is choosing its next partners carefully to make sure they fit with Square’s overall strategy. But don’t expect Square to integrate with other mobile payment systems. Rabois said customers don’t want more complications and connections to “bloated” payment systems. He said Square, however, could see more use for QR codes in the future. While the Starbucks integration began with the Square Wallet app presenting a QR code, which works with Starbucks’ existing hardware, the plan is to roll out Square Wallet’s “pay by name” feature in Starbucks stores in 2013 so users will be able to just give their name and show their face to pay to confirm the transaction. 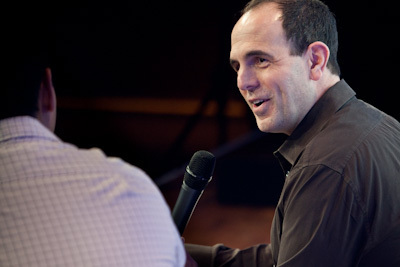 But even when that happens, there’s an opportunity to use QR code technology in conjunction with Square, Rabois said. Looking ahead, the big plan is for Square to establish itself abroad. Square launched internationally for the first time in Canada last month, but Rabois said the global rollout will pick up much more steam in the coming year. And he hinted there’s some more news coming before the end of 2012.